Rebecca Zook - Making Math Magical and Master-able for Kids on a Mission - Math Tutoring Online - More than Just a Math Tutor » It’s time to dance… MATH dance! 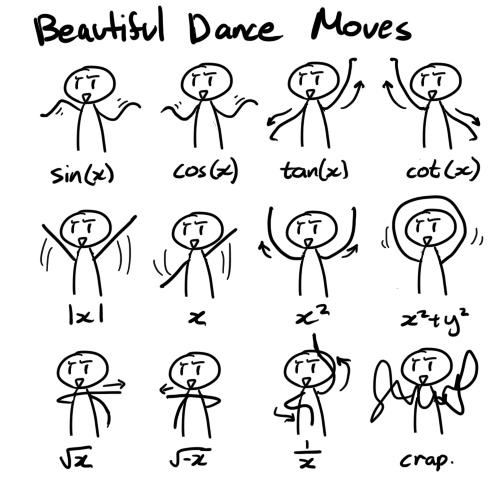 I imagine learning these dance moves would be just as complicated (if not more so) than learning the math itself! Fun concept though. You know, I really think it depends on the student. For some students, learning dance moves might be harder than memorizing graphs. For others, dancing the graph could really make it click. That’s why I collect lots of different ways of explaining things so I have more than one way to help each student.